Years after designing the entry ponds and landscape master plan for this home in South Eugene, Stangeland & Associates was asked to re-design the pool and access sequence to the house. What was an outdated design with materials at the end of their life-spans, was re-formulated to bring liveliness and longevity to a naturally quiet and reflective landscape. Preserving a majestic Oak tree, connecting to an expansive wooded property, rebuilding a toppling brick wall, designing a natural diving platform and creating a living wall were the highlights of a long and challenging project. Durable local stone and stained concrete paired with brightly colored furnishings and small extravagances, made the new landscape comfortable, open, and inviting. 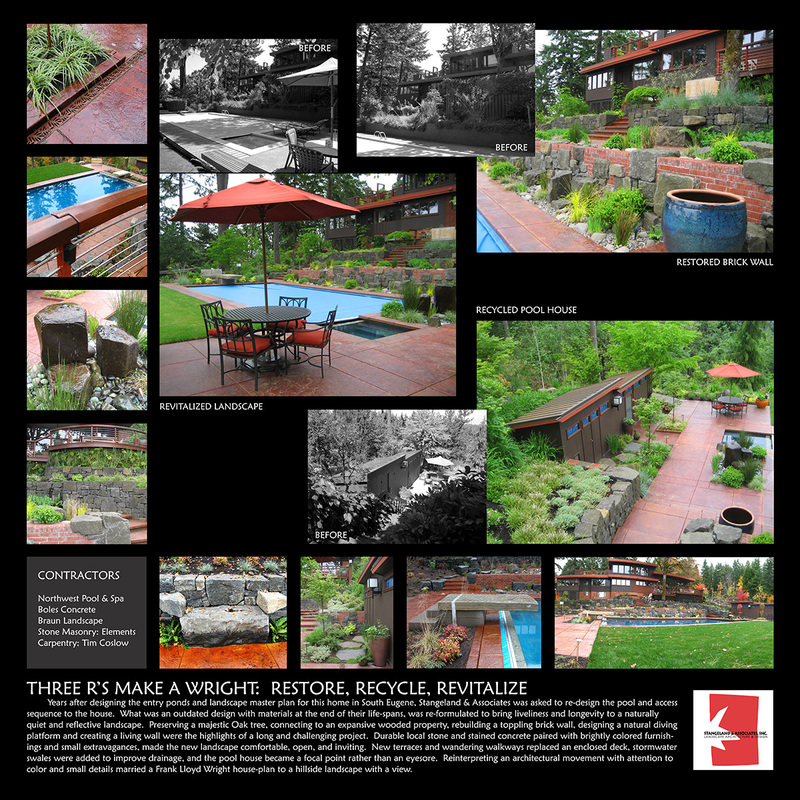 New terraces and wandering walkways replaced an enclosed deck, stormwater swales were added to improve drainage, and the pool house became a focal point rather than an eyesore. Reinterpreting an architectural movement with attention to color and small details married a Frank Lloyd Wright house-plan to a hillside landscape with a view.